At Woodside Dental Care, our team doesn’t just want to give you and your loved ones a healthy smile, we want to completely change your perception of dentistry and challenge the idea that going to the dentist is unpleasant. Our dental office offers high quality care, maximum convenience, and the kind of friendly service you’d expect at a small Mom & Pop store. Thanks to Dr. Cornetta and our team, getting a beautiful, healthy smile has never been so easy. 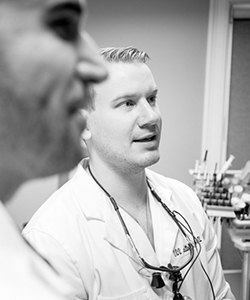 Dr. Cornetta and his team are cultivating a totally different type of dental experience than the one you are probably used to. At Woodside Dental Care, we are focused on trust, integrity, and creating great relationships that are truly built to last. We treat our patients like actual people and not like they are just a set of teeth. This is essential to who we are, and it’s why our patients choose us again and again. Dr. Cornetta believes that trust and loyalty should be the norm and not the exception. Our goal is to create a consistent and enjoyable patient experience, so we can be you and your family’s dentist for life. Let us show you just how easy coming to the dentist can be! Every time you visit us, you can expect a conservative and caring approach provided by the friendliest dentist and our warm, caring team. We’ll take the least invasive approach to achieve your oral health goals. That way, we can help you save time and money while still giving you a healthy smile. Also, patient education is extremely important to us. We strive to empower our patients with dental knowledge, so they can have all the information they need to achieve optimal oral health. When this all comes together, it will change the way you think about the dentist and will give you a healthy set of teeth you’ll be able to enjoy for the rest of your life.